CDU Vice-Chancellor, Professor Barney Glover answers the media's questions regarding the NT Medical Program. The first sod at the site of the new building that will house the Northern Territory Medical Program has been turned as part of a special ceremony held today. CDU Vice-Chancellor, Professor Barney Glover and Flinders Vice-Chancellor, Professor Michael Barber joined the Federal Minister for Rural and Regional Health, Warren Snowdon, the NT Minister for Health, Kon Vatskalis, and Member for Solomon, Damian Hale in planting the first shovel for the Territory’s first full medical education program. 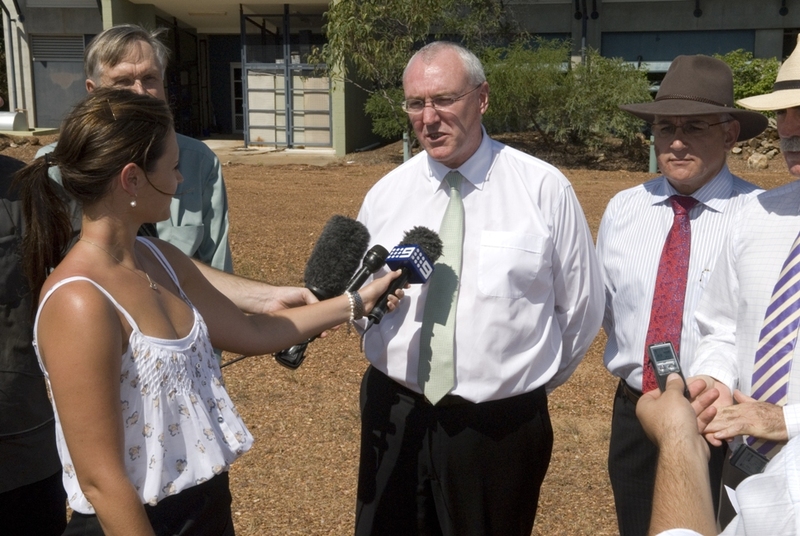 In May 2009, the Australian Government announced that it would provide $27.8 million in infrastructure funding to support the establishment of a full medical program in the Northern Territory. The program will be run by Flinders University with extensive support from CDU. Buildings to house the Medical Program will be established at CDU’s Casuarina campus and Royal Darwin Hospital. Professor Glover welcomed the support from the Australian Government and said that the medical program was a great outcome, not only for CDU and Flinders University, but also for the Territory as a whole. “We are grateful for the support from the Australian Government and the serious demonstration of their commitment to addressing Indigenous disadvantage,” Professor Glover said. “There is no doubt that health issues need tackling in the Territory especially in remote areas. Professor Glover pointed to the introduction of CDU’s new medical science courses, including the Bachelor of Clinical Sciences and the Bachelor of Medical Laboratory Sciences, as important elements of the development of the NT medical program and growing the CDU/Flinders partnership as a whole. As a nation-building partnership, the medical program aims to improve the health of Northern Territorians, particularly Indigenous Territorians, through training local doctors who are more likely to stay in the Territory after they graduate.